Alcohol remains the most widely abused drug among teens. The Dayton Area Drug Survey (DADS) is a biennial, cross-sectional study that provides estimates of non-medical drug use by school-aged teenagers in the Dayton, Ohio, area. First administered in 1990, the DADS is a collaborative effort between the Center for Interventions, Treatment and Addictions Research at Wright State University’s Boonshoft School of Medicine and area school districts. All area school districts are invited to participate in the survey at no charge and choose which grades between 7 and 12 they wish to survey. All schools are asked to conduct surveys for Grades 7, 9 and 12. Students respond anonymously and on a voluntary basis to the survey, completed by hand using a scantron form, following a protocol approved by the Wright State University Institutional Review Board. For the first time since the initiation of DADS in 1990, in 2016 the Center for Interventions, Treatment, and Addictions Research received funding to conduct the survey from the Montgomery County Alcohol, Drug Abuse and Mental Health Services Board. In early 2016, 10,786 students from 20 Miami Valley area schools provided usable data. Overall, the majority of the sample was White (81.6 percent), followed by African Americans (7.2 percent), Other (6.7 percent) and Asian (4.6 percent). The sample was nearly evenly split between boys and girls.For more information on DADS, call the Boonshoft School of Medicine’s Center for Interventions, Treatment & Addictions Research at (937) 775-1466. Results from the 2016 Dayton Area Drug Survey show declines (or stability) in the lifetime and current prevalence of use of virtually every drug among 12th grade students when compared with results from the 2014 DADS. Alcohol remains the most widely abused drug at all grade levels. Among 12th graders, 61.6 percent reported lifetime use, essentially the same as 2014 (62.0 percent). Marijuana ranks second in lifetime prevalence of use among 12th graders (41.0 percent), unchanged from 2014 (41.4 percent). The DADs assessed the use of e-cigarettes for the first time in 2016.The lifetime prevalence of e-cigarette use among 12th graders was 31.6 percent. Electronic cigarettes ranked third in terms of lifetime prevalence of use among 12th graders, while tobacco cigarettes ranked fourth. Among 12th graders, lifetime prevalence of cigarette use fell from 29.1 percent in 2014 to 23.5 percent in 2016. The DADs assessed the use of marijuana concentrates for the first time in 2016. Among 12th graders, 16.6 percent reported lifetime use of marijuana concentrates. Use of non-prescribed pharmaceutical opioids (e.g., hydrocodone, oxycodone) decreased. Among 12th graders, lifetime prevalence of use fell from 12.0 percent in 2014 to 8 percent in 2016. Among 12th graders, lifetime prevalence of heroin use fell from 3.6 percent in 2014 to 2.1 percent in 2016. Lifetime prevalence of synthetic cannabinoid use among 12th graders fell from 8 percent in 2014 to 4.1 percent in 2016. Among 12th grade students, 17 percent said they had operated a motor vehicle while under the influence of alcohol or non-prescribed drugs in their lifetimes, unchanged from 2014 (17.7 percent). Results from the 2014 Dayton Area Drug Survey (DADS) show declines in the lifetime and current prevalence of use of many drugs when compared with results from the 2012 DADS. There was an increase in prevalence of some drugs, such as hallucinogens, while others, such as crack, cocaine HCL, steroids, stimulants, ecstasy, and DXM, remained at 2012 levels. Alcohol still remains the most widely abused drug at all grade levels despite a decrease in use, followed by marijuana and tobacco cigarette use (see Tables). DADS is a biennial, cross-sectional study that provides estimates of non-medical drug use by school-aged teenagers in the Dayton, Ohio area. First administered in 1990, the DADS is a collaborative effort between the Center for Interventions, Treatment, and Addictions Research at Wright State University’s Boonshoft School of Medicine and area school districts, who participate in the survey at no charge and choose which grades between 7 and 12 they wish to survey. Students respond anonymously and on a voluntary basis, following a protocol approved by the Wright State University Institutional Review Board. In early 2014, 9,653 students from 15 Miami Valley area schools provided usable data. The majority of the sample was white and the sample was nearly evenly split between boys and girls. Alcohol was used by more school-aged teenagers than any other drug. Among 12th graders (n=1,833), 62 percent reported drinking alcohol at least once in their lifetime (down from 67.4 percent in 2012). Among the 44.8 percent who reported drinking to the point of drunkenness at least once (down from 50.3 percent in 2012), 38.7 percent said they had done so 10 or more times (down from 41.7 percent in 2012). In the two weeks before the survey, 18.9 percent of the 12th graders reported having had five or more drinks in a row on at least one occasion, down from 23.6 percent in 2012. Among 9th graders (n=1,895), 32.9 percent reported lifetime experience with alcohol (down from 41.2 percent in 2012), 16.6 percent reported having been drunk at least once (down from 22.3 percent in 2012), and 15.9 percent of these reported doing so 10 or more times (down from 19.8 percent in 2012). Having five or more drinks in a row in the two weeks before the survey was reported by 4.7 percent (down from 8.0 percent in 2012). The corresponding percentages for 7th graders (n=2,518) are 13.5 percent, 3.3 percent, 15.9 percent, and 1.2 percent, respectively. (Data for 8th (n=1704), 10th (n=655), and 11th (n=736) graders are not reported in this summary but fit well within the data reported by 7th, 9th, and 12th graders). Marijuana remains the second most widely used drug by school-aged students. Among 12th grade students, 41.4 percent reported having used marijuana at least once in their lifetime (down from 43.9 percent in 2012). The percentage of 12th graders reporting daily use, defined as having used a drug 20 or more times in the 30 days prior to the survey, decreased from 6.9 percent in 2012 to 5.3 percent in 2014. About 17 percent of 9th graders and 4.7 percent of 7th graders reported lifetime marijuana use. Tobacco cigarettes remain the third most widely used drug, with 29.1 percent of 12th graders reporting having smoked at least once, down from 37.1 percent in 2012. 12th graders reporting smoking at least one cigarette a day or more decreased from 8.3 percent in 2012 to 5.1 percent in 2014. Among 9th graders, 14.8 percent reported having smoked at least once in their lifetime, down from 19.8 percent in 2012. Similarly, 6.1 percent of 7th graders reported having smoked at least once in their lifetime, down from 9.5 percent in 2012. Among 12th graders, in addition to decreases with alcohol, cigarettes, and marijuana, decreases in the lifetime prevalence of use occurred with smokeless tobacco, inhalants, nitrous oxide, opiates, tranquilizers, methamphetamine, over-the-counter stay awake/weight loss agents, synthetic cannabinoids, and salvia divinorum. Rates remained essentially unchanged for crack cocaine, cocaine HCl, steroids, heroin, stimulants, ecstasy, dextromethorphan (DXM), and “bath salts.” Slight increases were reported for hallucinogens and Ritalin (methylphenidate). The directions of the 9th and 7th grade prevalence rates are virtually the same as those for the 12th grade, with the use of most drugs declining or remaining essentially the same as in 2012. In 2012, DADS described the use of synthetic cannabinoids, salvia divinorum, and “bath salts” for the first time. In 2014, the lifetime prevalence of synthetic cannabinoid use among 12th graders was 8.0 percent, down from 15.5 percent in 2012. The lifetime prevalence of salvia divinorum use was 2.3 percent, down from 4.6 percent in 2012. The lifetime prevalence use of “bath salts” remained essentially unchanged at 1.8 percent in 2014, compared to 1.5 percent in 2012. Motor vehicle behaviors. High school seniors were queried about drug use and motor vehicle behaviors. When asked if they had ridden in a motor vehicle when they believed the driver was under the influence of alcohol or other non-medical drugs (other than caffeine or tobacco), 35.3 percent said they had. This is a significant decrease from 2012 when 42.7 percent said they had. When asked if they had driven a motor vehicle while under the influence, 17.7 percent reported they had; this is also a decrease from 24.2 percent reported in 2012. Of those who reported having driven under the influence, 56 percent said that had done so more than once or twice, about the same as 2012 (55.7 percent). Bullying. In 2014, 24.4 percent of 7th graders, 22.3 percent of 9th graders, and 14.9 percent of 12th graders felt bullied or harassed by other teens in the 30 days before the survey. In 2012, 28.4 percent of seventh graders, 24.2 percent of ninth graders, and 16 percent of 12th graders felt bullied by other teens in the 30 days before the survey. Physical Fights. In 2014, 11.0 percent of 7th graders, 7.5 percent of 9th graders, and 6.7 percent of 12th graders got into a physical fight with someone in the 30 days before the survey. These percents are quite similar to those in 2012 results with12.6 percent of seventh graders, 10.5 percent of ninth graders, and 7.1 percent of 12th graders got into a physical fight with someone in the 30 days before the survey. Missed School. 4.5 percent of seventh graders, 3.8 percent of ninth graders, and 10.8 percent of 12th graders missed school without permission of a parent of guardian in the 30 days before the survey. Again, the results are similar to those in 2012 where 4.5 percent of seventh graders, 4.6 percent of ninth graders, and 11.4 percent of 12th graders missed school without the permission of a parent or guardian in the 30 days before the survey. Employment. 52.1 percent of 12th graders reported being employed outside of the home or school in 2014, compared to 55.4 percent in 2012. Happiness. About 85 percent of seventh graders, 85 percent of ninth graders, and 87 percent of 12th graders considered themselves to be happy or very happy with their lives, while the remainder considered themselves to be unhappy or very unhappy. These results are largely consistent with findings from 2012, during which about 84 percent of seventh graders, 86 percent of ninth graders and 89 percent of 12th graders considered themselves to be happy or very happy with their lives, while the remainder considered themselves to be unhappy or very unhappy. It is important to note that the DADS was administered in late winter and early spring of 2014, so the prevalence data may have changed by the end of the school year in June. It is also important to note that the schools participating in the DADS were not randomly selected, since they selected themselves. This limits the generalizability of the results. Nevertheless, given the level of student participation, the number of school districts participating, and the geographic distribution of the participating districts, there is good reason to think the DADS results are reasonable reflections of drug use practices among suburban young people in the Dayton area. Lastly, aside from tobacco, alcohol, marijuana and some pills and products, i.e., those pills whose identity is readily apparent, such as brand name DXM or methylphenidate or products that come in labeled packages, students’ self-reports of use of less easily identifiable drugs, like cocaine and heroin, should be viewed with at least some skepticism, since young people may well not know what they actually used. Since the DADS was first administered in 1990, several trends can be identified. First, alcohol and tobacco use have decreased dramatically. Second, even though marijuana use has increased and decreased and increased, its lifetime use prevalence is essentially the same now as it was in 1990. Third, the non-prescribed use of tranquilizers increased dramatically from about 10 percent in 1990 nearly doubling to 19 percent in 2000, but has decreased its 1990 levels of 11.3 percent in 2014. A remarkably similar pattern is found with illicit use of prescription opiates which jumped from 3 percent in 1990 to about 18 percent in 2000. Like tranquilizer use, its lifetime use among 12th graders as steadily declined over the past 14 years to 12 percent in 2014. All things considered, the data suggest that efforts to prevent teen drug use have met with mixed success. (See some of our previous relevant research.) Thus, we again point out the need to implement on-going drug abuse prevention programs in the schools that extend beyond the ninth grade, when such efforts often end. The rationale for such a recommendation is based on the fact that school is the place where large numbers of young people congregate and the strong evidence that initiation of drug use continues throughout the high school years. DADS data have repeatedly shown that the percentage of teens who will get drunk for the first time will double between the ninth and 12th grades. Marijuana use also doubles. Implementing and sustaining evidence-based, public health-oriented prevention programs can help reduce the rate of erosion of abstinence as well as decrease drug-related problems among young people. Results from the 2012 Dayton Area Drug Survey (DADS) show declines in the lifetime and current prevalence of use of many drugs when compared with findings from 2010 DADS. Nevertheless, increases in prevalence were noted for some drugs and there was essentially no change for others. For example, among 12th grade students, decreases in prevalence of use occurred with 12 drugs, increases with two, and five others remained at 2010 levels. A similar pattern was seen with ninth and seventh grade students (see DADS Tables). Although its use has decreased, alcohol remains the most widely abused drug at all grade levels, as it has for as long as the survey has been conducted. Data also suggest that about one in six high school seniors are at high-risk for a substance use disorder. DADS is a biennial, cross-sectional study that provides estimates of non-medical drug use by school-aged teenagers in the Dayton area. First administered in 1990, the DADS is a collaborative effort between the Center for Interventions, Treatment & Addictions Research at Wright State University’s Boonshoft School of Medicine and area school districts. Districts participate in the DADS at no charge and choose which grades between seven and 12 to survey. Students respond anonymously and on a voluntary basis following a protocol approved by the Wright State University Institutional Review Board. In early 2012, 15,734 students from 16 Miami Valley area school districts provided usable data. The majority of the sample was white (about 82 percent) and the sample was nearly evenly split between boys and girls. Marijuana is now the second most widely used drug by high school-aged students, surpassing tobacco cigarettes. The percentage of 12th grade students who reported having used marijuana at least once in their lifetime was 43.9 percent, virtually unchanged from 44.1 percent in 2010. The percentage of 12th graders reporting daily use, defined as having used a drug 20 or more times in the 30 days before the survey, increased slightly from 6.3 percent in 2010 to 6.9 percent in 2012. Lifetime marijuana use was reported by 20.7 percent of ninth graders, with 2.2 percent reporting daily use. Nearly 6 percent of seventh graders reported having used marijuana at least once. Tobacco cigarettes ranked third in lifetime prevalence of use with 37.1 percent of 12th graders reporting having smoked at least once, down from 41.6 percent in 2010. High school seniors reporting smoking at least one cigarette a day or more decreased to 8.3 percent, down from 11.3 percent in 2010. Levels of cigarette smoking also declined among ninth graders but remained unchanged among seventh graders. Among 12th graders, in addition to decreases with alcohol and cigarettes, decreases in the lifetime prevalence of use occurred with smokeless tobacco, non-prescribed prescription opioids and tranquilizers, heroin, Ritalin, over-the-counter stay awake/weight loss agents, inhalants and nitrous oxide, cocaine HCl and dextromethorphan (DXM). Rates remained essentially unchanged for crack cocaine, steroids, hallucinogens and methamphetamine. Increases were noted for MDMA/ecstasy and amphetamine. The directions of the ninth grade prevalence rates are virtually the same as those for the 12th grade. An increase, from 4.8 percent to 5.9 percent in marijuana use was noted among seventh graders, while the use of other drugs declined or remained essentially the same as in 2010. New for DADS in 2012 were questions about the use of synthetic cannabinoids, salvia divinorum and “bath salts,” drugs that are known for their somewhat to very unpredictable effects. At times available online or in smoke shops or convenience stores, these drugs are now illegal in Ohio. The lifetime prevalence of synthetic cannabinoid use among 12th graders was 15.5 percent, with annual use rate at 11.7 percent — essentially the same as national annual prevalence data. Virtually all of the synthetic cannabinoid users had a history of marijuana use. Nearly two-thirds of them were boys. The lifetime prevalence of salvia use was 4.6 percent, with annual use at 2.6 percent — lower than what has been reported nationally. “Bath salts” lifetime prevalence was 1.5 percent, with annual prevalence at 1.2 percent. There are no comparable national data for “bath salt” use among teens. High school seniors were queried about drug use and motor vehicle behaviors. When asked if they had ridden in a motor vehicle when they believed the driver was under the influence of alcohol or other non-medical drugs (other than caffeine or tobacco), 42.7 percent said they had. When asked if they had driven a motor vehicle while under the influence, 24.2 percent reported they had. Of those who reported having driven under the influence, 55.7 percent said that had done so more than once or twice. By the time 12th graders in the 2012 DADS sample neared the end of their high school careers, 48.1 percent reported having used an illicit drug at least once in their lifetimes, while 30.6 percent reported having used an illicit drug other than marijuana at least once. In contrast, 28.1 percent of high school seniors reported never having used alcohol, tobacco, or any illicit drugs. Essentially equal proportions of girls and boys were abstemious. The 2012 DADS included CRAFFT, a six-item screening test for clinically-defined problematic drug use. Data from 12th grade students responding to CRAFFT suggests that 17.5 percent of them have had or currently engage in substance use practices indicative of drug dependence. The prevalence of problematic use remains unchanged from 2010. (More information about CRAFFT scores and the DADS is available at: www.ncbi.nlm.nih.gov/pubmed/22494092). About 84 percent of seventh graders, 86 percent of ninth graders and 89 percent of 12th graders considered themselves to be happy or very happy with their lives, while the remainder considered themselves to be unhappy or very unhappy. It is important to note that the DADS was administered in late winter and early spring of 2012, so the prevalence data may have changed by the end of the school year in June. It is also important to note that the schools participating in the DADS were not randomly selected, they selected themselves. This limits the generalizability of the results. Nevertheless, given the level of student participation, the number of school districts participating and the geographic distribution of the participating districts, there is good reason to think the DADS results are a reasonable estimate of drug use practices among suburban young people in the Dayton area. Lastly, aside from tobacco, alcohol, marijuana and some pills and products, i.e., those pills whose identity is readily apparent, such as brand name DXM or methylphenidate or products that come in labeled packages, students’ self-reports of use of less easily identifiable drugs, like cocaine and heroin, should be viewed with at least some skepticism since young people may well not know what they actually used. Since the DADS was first administered in 1990 several trends can be identified. First, alcohol and tobacco use have decreased dramatically. Second, even though its use has increased and decreased and increased, the lifetime prevalence of marijuana use is essentially the same now as it was in 1990. Third, the non-prescribed use of prescription opioids and tranquilizers has increased dramatically but their use is confined to a relatively small minority of young people. All things considered (see some of our previous relevant research at: www.ncbi.nlm.nih.gov/pubmed/12357910?dopt=Abstract), the data suggest that efforts to prevent teen drug use have met with mixed success. Thus, we again point out the need to implement on-going drug abuse prevention programs in the schools that extend beyond the ninth grade, when such efforts often end. The rationale for such a recommendation is based on the fact that school is the place where large numbers of young people congregate and the strong evidence that initiation of drug use continues throughout the high school years. DADS data have repeatedly shown that the percentage of teens who will get drunk for the first time will double between the ninth and 12th grades. Marijuana use also doubles. Implementing and sustaining evidence-based, public health-oriented prevention programs can help reduce the rate of erosion of abstinence as well as decrease drug-related problems among young people. Results from the 2010 Dayton Area Drug Survey (DADS) suggest the long-running trend of declining drug use by teens may be ending. For example, the percentage of 12th grade students reporting ever having been drunk increased from 54.3 percent in 2008 to 55.2 percent in 2010, with similar sized increases occurring for 7th and 9th graders as well. For the first time in many years, the percentage of teens reporting experience with cigarettes and smokeless tobacco increased. Marijuana initiation also increased over 2008 levels. And while the increases were generally small, they may be a harbinger of an upward swing in youthful drug use. The 2010 results were presaged by the mixed news from the 2008 DADS where it appeared the decline in the initiation of use had stalled with high school seniors. Notably, there are epidemiological indicators from several recent national surveys that also suggest the decline has leveled out and may be tilting upwards, at least for some drugs. Consequently, what is happening here in the Dayton area may be part of a national trend. DADS is a biennial, cross-sectional study that provides estimates of teen drug use in the Miami Valley. First administered in 1990, DADS is a collaborative effort between the Center for Interventions, Treatment, and Addictions Research at Wright State University's Boonshoft School of Medicine and area school districts, who participate in the survey at no charge. Districts choose which grades between 7 and 12 they want to survey. Students respond anonymously and on a voluntary basis, following a protocol approved by the Wright State University Institutional Review Board. In the spring 2010, 16,307 students from 15 Miami Valley area school districts provided usable data. The majority of the sample was white (about 82 percent), suburban and nearly evenly split between boys and girls. DADS data on alcohol use reflect the scope of the substance abuse problem among young people in grades 7-12. As we have repeatedly noted in previous reports, alcoholic beverages are widely advertised and used in our society. Consequently, attitudes toward the use of alcohol are more tolerant than they are toward the use of other drugs. Research on alcohol and brain development in adolescents suggests that alcohol use, heavy use in particular, is fraught with long term, adverse consequences. Research also suggests that young people who get involved with alcohol while they are young teens have a much higher likelihood of becoming alcoholics than those who postpone drinking until they are older. A multi-faceted, preventive approach, such as the one that has been effective with tobacco, has not been applied to alcohol, particularly in regard to advertising. Imposing restrictions on alcohol advertising as part of a comprehensive effort to change teens' attitudes toward alcohol as well as their drinking practices should be seriously considered. DADS data show 41.6 percent of high school seniors reported any cigarette use, up from 39.8 percent in 2008. Similar increases also occurred among 9th and 7th grade students. This is another signal that the decline seems to have stalled. It is noteworthy that Ohio now ranks 45th among states in funding tobacco prevention efforts, down from 2007 when it ranked 13th. Teenagers' use alcohol and tobacco is significant for at least two reasons. First, it is well-known that the abuse of these drugs alone can result in a variety of untoward health and social consequences, some of which can last a lifetime. Secondly, tobacco and alcohol are "gateway drugs," drugs whose use often presages the abuse of other drugs. Consequently, people concerned about preventing teen drug abuse need to pay careful attention to teens' involvement with alcohol and tobacco. The percentage of 12th grade students who reported having used marijuana (or hashish) at least once increased significantly, from 39.4 percent in 2008 to 44.1 in 2010. The percentage of teens reporting daily marijuana use, defined in DADS as having used the drug 20 or more times in the 30 days before the study, also increased, from 4.7 percent in 2008 to 6.3 percent in 2010. Lifetime marijuana use was reported by 22.0 percent of 9th graders, with 2.3 percent reporting daily use. Nearly 5 percent of 7th graders reported having used marijuana at least once. Among 12th graders, increases occurred in the lifetime use of non-prescribed prescription drugs including depressants, such as the benzodiazepines, opioids like hydrocodone and oxycodone, amphetamine and methylphenidate as well as non-prescription drugs like cocaine HCl, hallucinogens, and inhalants. The use of dextromethorphan, a common ingredient in over-the-counter cough and cold preparations, increased from 3.8 percent in 2008 to 6.2 percent in 2010. The reported use of crack cocaine and steroids decreased as did the use of over-the-counter diet and stay-awake pills. The percentages of 12th graders reporting the lifetime use of ecstasy and methamphetamine were unchanged from 2008. If there is any good news in the 2010 DADS findings, it is that the percentage of young people who use drugs other than alcohol, tobacco, and marijuana heavily is very small, much less than 1 percent of the sample in any given grade. High school seniors were queried about drug use and motor vehicle behavior. When asked if they had ridden in a motor vehicle when they believed the driver was under the influence of alcohol or other non-medical drugs (other than caffeine or tobacco), 45.7 percent said they had, essentially the same as in 2008. Among these, 60.6 percent reported that they had done so more than once or twice. When asked if they had driven a motor vehicle while under the influence, 27.8 percent reported they had. Among these, 57.1 percent reported they had done so more than once or twice. By the time 12th graders in the 2010 DADS sample neared the end of their high school careers, 49.2 percent reported having used an illicit drug at least once in their lifetimes, while 29.3 percent reported having used an illicit drug other than marijuana at least once. In contrast, 21.8 percent of high school seniors reported they had never having used alcohol, tobacco, or any illicit drugs. Essentially equal proportions of girls and boys were abstemious. The 2010 DADS incorporated CRAFFT, a 6-item screening test for clinically-defined problematic drug use, developed by John Knight and his colleagues at Harvard Medical School. Data from 12th grade students responding to CRAFFT suggests that 17.5 percent of them have had or currently have substance use practices indicative of drug dependence. About 84 percent of 7th graders, 86 percent of 9th graders and 89 percent of 12th graders considered themselves to be happy or very happy with their lives, while the remainder considered themselves to be unhappy or very unhappy. It is important to note that DADS was administered in late winter/early spring of 2010, so the percentages may have changed by the actual end of the school year in June. It is also important to note that the schools and classes participating in DADS are not randomly selected, nor could they have been given what DADS is - a community service designed to give school districts what they want, a series of snapshots over time to help them understand the drug use practices of the young people who attend their schools. Therefore, the results of DADS are limited to those districts which actually participated in the study. Another limitation of DADS is that it does not assess some of the more esoteric drug use practices such as those involving synthetic compounds that mimic cannabinoids or naturally occurring plants like salvia and jimsonweed, to name but a few. Overall, DADS results suggest the need for ongoing, intensive drug abuse prevention programs in the schools that extend beyond the 9th grade, when such efforts currently often end. The rationale for such an extension is based on the fact that school is the place where large numbers young people congregate and the strong evidence that initiation of drug use continues throughout adolescence. For example, DADS data suggest that the percentage of teenagers who will get drunk for the first time will double between the 9th and 12th grades. Marijuana use will also come close to doubling. Implementing and sustaining evidence-based, public health-oriented school and community prevention programs can help reduce the rate of erosion of abstinence as well as decrease drug-related problems among teens. Results from the 2008 Dayton Area Drug Survey (DADS) are mixed. The good news is that data from seventh and ninth grade students show that the general decline in the initiation of drug use noted in previous years has continued. Less encouraging are data from high school seniors suggesting that, among these older students, the decline may have stalled, at least for some drugs. Overall, the largest declines in drug use initiation occurred with alcohol and cigarettes. Even so, these drugs, along with marijuana, are still the ones most commonly abused by area school-aged teens. DADS is a biennial, cross-sectional study that provides estimates of teen drug use in the Miami Valley. First administered in 1990, DADS is a collaborative, eleemosynary effort between the Center for Interventions, Treatment and Addictions Research at Wright State University Boonshoft School of Medicine, Unified Health Solutions, and area school districts. Districts choose which grades between 7 and 12 they want to survey. Students respond anonymously and on a voluntary basis. In the spring 2008, 17,315 students from 17 Miami Valley school districts provided usable data. The majority of the sample was white (about 83 percent), largely suburban, and nearly evenly split between boys and girls. Alcohol remains the most widely used drug. Among 12th graders, more than 70 percent reported drinking alcohol at least once in their lifetimes. Of these, 54.3 percent reported being drunk at least once. Among those who reported drinking to drunkenness, 46.8 percent said they had done so 10 or more times. In the two weeks before the survey, 27.2 percent of the respondents reported having had five or more drinks in a row on at least one occasion. Among ninth graders, 45.7 percent reported lifetime experience with alcohol, 24.7 percent reported having been drunk at least once, and 21.2 percent of these reported doing so 10 or more times. Nine percent reported having five or more drinks in a row in the two weeks before the survey. The corresponding percentages for seventh graders were 21.2 percent, 6.2 percent, 9.2 percent, and 2.5 percent, respectively. DADS data on alcohol use reflect the scope of the problem. As we have noted in previous reports, alcoholic beverages are widely advertised and used in our society. Consequently, attitudes toward the use of alcohol are more tolerant than they are toward the use of other drugs. Research on alcohol and brain development in adolescents suggests that alcohol use, heavy use in particular, is fraught with long term, adverse consequences. Research also suggests that young people who get involved with alcohol while they are young teens have a much higher likelihood of becoming alcoholics than those who postpone drinking until they are older. A multi-faceted, preventive approach, such as the one that has been so effective with tobacco, has not been applied to alcohol, particularly in regard to advertising. 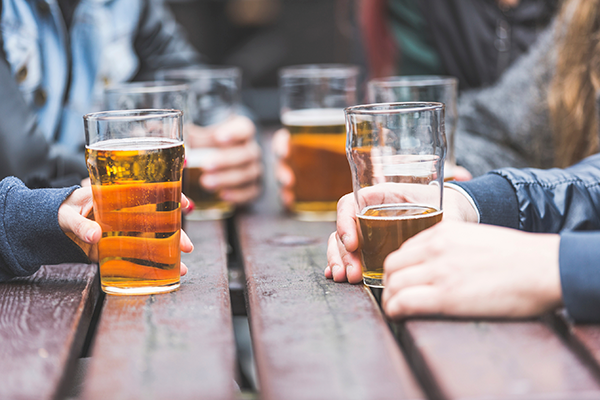 Imposing restrictions on alcohol advertising as part of a comprehensive effort to change teens' attitudes toward alcohol as well as their drinking practices should be seriously considered. DADS data show 39.8 percent of high school seniors reported any cigarette use, down from 43.4 percent in 2006. Similar decreases also occurred among ninth and seventh grade students. Although initiation rates are continuing to decline, the percentage of young people who reported smoking a half pack or more per day or smoking daily was essentially unchanged from 2006. These results suggest that anti-tobacco efforts targeting teens are succeeding in reducing smoking initiation, but may be less successful in stopping smoking once it moves beyond experimentation. Data from future surveys will help clarify this issue. The percentage of 12th grade students who reported having used marijuana/hashish at least once declined slightly, from 40.9 percent in 2006 to 39.4 percent in 2008. The percentage of teens reporting daily marijuana use, defined in DADS as having used the drug 20 or more times in the 30 days before the study, remained essentially unchanged at 4.7 percent. Lifetime marijuana use was reported by 16.2 percent of ninth graders with 1.3 percent reporting daily use. Less than 2 percent of seventh graders reported ever having used marijuana. Among 12th graders declines occurred in the lifetime use of cocaine HCl, crack, hallucinogens, amphetamine, methamphetamine, dextromethorphan (a cough suppressant), inhalants, and steroids, although some of the decreases are very slight. A major decrease occurred in the use non-prescription diet pills and stay-awake remedies, from 19.7 percent in 2006 to 13.8 percent in 2008. Slight increases in the lifetime use of the following drugs were noted: non-prescribed prescription opiates, non-prescribed prescription tranquilizers, methylphenidate (e.g., Ritalin), MDMA (ecstasy), and heroin. Seniors were queried about drug use and motor vehicle behavior. When asked if they had ridden in a motor vehicle when they believed the driver was under the influence of alcohol or other non-medical drugs (other than caffeine or tobacco), 45.8 percent said they had. Among these, 49.1 percent reporting that they had done so more than once or twice. When asked if they had driven a motor vehicle while under the influence, 28.7 percent reported they had. Among these, 56.9 percent reported they had done so more than once or twice. These rates are essentially the same as they were in 2006. By the time young people in the DADS sample near the end of their secondary education, 44.3 percent have used an illicit drug at least once, while 25.9 percent reported having used an illicit drug other than marijuana at least once. In contrast, 22.6 percent of high school seniors reported never having used alcohol, tobacco, or any illicit drugs. Proportionately more girls than boys were abstemious - 54.6 percent to 44.8 percent. It must be noted that DADS was administered in late winter/early spring, so these percentages may have changed by the time of actual graduation. About 89.1 percent of the students currently considered themselves to be happy or very happy with their lives while the remainder considered themselves to be unhappy or very unhappy. Overall, DADS results suggest the need for on-going, intensive drug abuse prevention programs in the schools that extend beyond the ninth grade, when such efforts often end. The rationale for such an extension is based on the fact that school is the place where large numbers young people congregate and the strong evidence that initiation of drug use continues throughout adolescence. For example, DADS data suggest that the percentage of teenagers who will get drunk for the first time will double between the ninth and 12th grades. Marijuana use will also come close to doubling. Implementing and sustaining evidence-based, public health-oriented school and community prevention programs can help reduce the rate of erosion of abstinence as well as decrease drug-related problems among teens. Results from the 2006 Dayton Area Drug Survey (DADS) show that the decline in drug use among adolescents in the Miami Valley, first noted in 2002, has continued. These findings are consistent with those from national studies which have also shown declining drug use among young people. Although there were declines in virtually all categories of drug use, the largest decreases were seen with cigarettes. Overall, the results are good news for all concerned about the health, safety, and welfare of young people. Nevertheless, the results also show that drug abuse remains a serious problem for many teens here in the Dayton area. For the first time in the history of DADS, less than half (43 percent) of the 12th graders surveyed reported ever having smoked a cigarette, down from 51 percent in 2004. The percentage of 12th graders who reported smoking at least one cigarette per day in the past month also declined from 14 percent to 11 percent. Significant decreases occurred in cigarette use at all other grade levels surveyed. From a public health perspective, the declining number of teen smokers means that there are likely to be fewer adult smokers in the future. Equally important, from a substance abuse prevention perspective, is that tobacco is a "gateway drug," and declines in its use often presage declines in the use of other drugs. DADS is a biennial, cross-sectional study that provides estimates of teen drug use in the Miami Valley area. First administered in 1990, DADS is a collaborative effort between the Center for Interventions, Treatment, and Addictions Research at the Wright State University's Boonshoft School of Medicine, Unified Health Solutions, and area school districts. Districts choose which grades between 7 and 12 they want to survey. Students respond anonymously and on a voluntary basis. In late winter and early spring 2006, 16,500 students from 15 districts in Montgomery, Greene, and Warren counties responded to DADS. The majority of the sample was white (82 percent), suburban (95 percent), and evenly split between boys and girls. The decline in alcohol use was less dramatic than that seen with cigarettes. For example, 2006 data show that 58 percent of 12th graders, 29 percent of 9th graders, and 8 percent of 7th graders report having gotten drunk at least once in their lifetimes, compared to 61 percent, 30 percent, and 9 percent in 2004. Recent heavy drinking (i.e., having had five or more alcoholic drinks in a row in the two weeks prior to DADS) was reported by 30 percent of the 12th graders in 2006, compared to 32 percent in 2004. The percentage of 12th graders reporting ever having used marijuana declined from 44 percent in 2004 to 41 percent in 2006, the lowest in the history of DADS. The use of many other drugs declined as well but still persists. For example, 20 percent of the sample reported the use of over-the-counter weight loss preparations, with proportionately more girls than boys doing so. The non-prescribed use of prescription opiates such as Vicodin® was reported by 15 percent of the sample and 14 percent reported the non-prescribed use of tranquilizers such as Xanax®. The use of hallucinogenic drugs such as LSD and psilocybin mushrooms was reported 9 percent of 12th grade students. The non-prescribed use of prescription stimulants such as Adderall® remained stable at 8 percent of the 12th grade cohort. The use of cocaine HCl and crack cocaine was 7 percent and 4 percent, respectively. For all grade levels, except the 7th, alcohol was the most commonly used drug, followed by tobacco, and then marijuana. Among 7th graders, alcohol was followed by tobacco, inhalants, and then marijuana. Also, some variation in drug use prevalence exists among districts. The findings on alcohol consumption are particularly worrisome. While it is generally recognized that tobacco and other non-medical drug use are harmful to health, alcohol is widely promoted and used in our society. Consequently, attitudes towards its use are more tolerant than they are towards the use of other drugs. Recent and emerging research on alcohol use and brain development in adolescents suggests that alcohol - heavy use in particular - is fraught with long term, adverse consequences. Research also suggests that young people who get involved with alcohol while they are young teens have a much higher likelihood of becoming alcoholics than those who postpone drinking until they are older. 2006 DADS data show that the vast majority of young people still see drinking alcohol as acceptable behavior. The multi-faceted approach that has been effective with tobacco has not been applied to alcohol, particularly in regard to advertising. Imposing restrictions on alcohol advertising as part of a comprehensive effort to change teens' attitudes toward alcohol as well as their drinking practices should be seriously considered. DADS data on the degree of harmfulness young people attribute to selected drugs are instructive. For example, 77 percent of 7th graders see tobacco use as very harmful, while 47 percent see alcohol that way. By grade 12, there is some erosion with tobacco, with 63 percent seeing its use as very harmful, while only 25 percent see alcohol use as very harmful. These data suggest there may be value providing substance abuse prevention programming throughout high school. Currently, the most intense substance abuse prevention efforts end by 8th or 9th grade. For the first time in DADS history, 12th grade students were queried on drug use and motor vehicle behavior. When asked if they had ridden in a motor vehicle when they believed the driver was under the influence of alcohol or other non-medical drugs (other than caffeine or tobacco), 46 percent said they had, with 28 percent reporting that they had done so more than once or twice. When asked if they had driven a motor vehicle under the influence, 31 percent reported they had, and 18 percent reported they had done so more than once or twice. When asked to identify the single most common source of alcoholic beverages for young people, 51 percent of 12th graders reported parties without parents present, 21 percent said adult siblings, 17 percent said stores, and 7 percent said parents. About 85 percent of the students currently considered themselves to be happy or very happy with their lives while the remainder considered themselves to be unhappy or very unhappy.